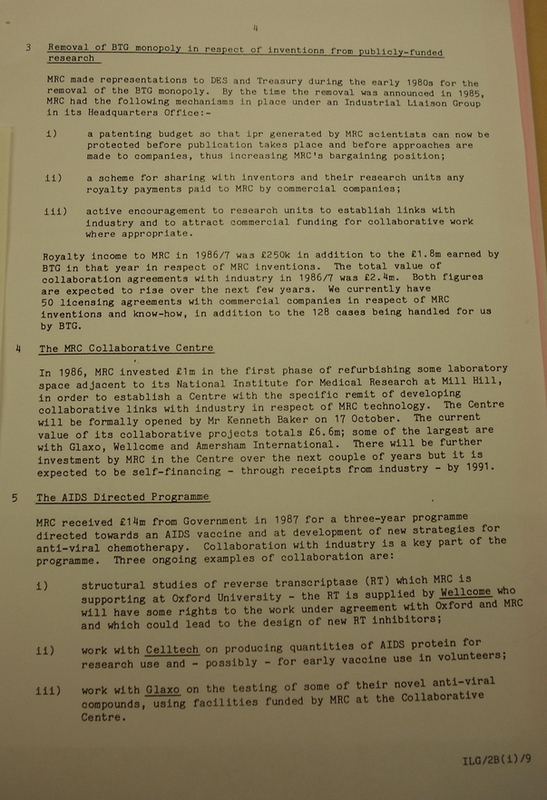 In July 1975 Milstein gave a presentation on monoclonal antibodies at an internal Medical Research Council (MRC) meeting convened to discuss the safety of genetic engineering. After his presentation, he was approached by Tony Vickers, a scientist by training and an administrative official of the MRC . Vickers was interested in learning more and requested the proofs of the article Milstein and Köhler were about to have published in Nature. 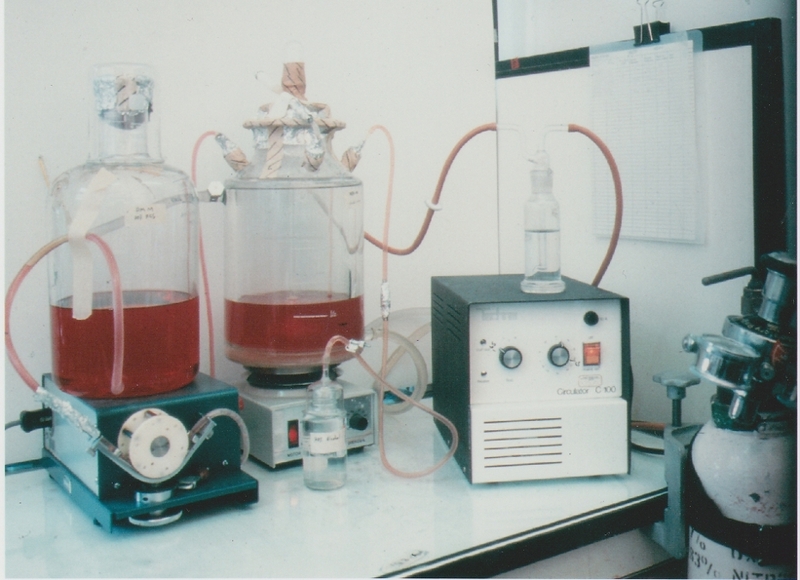 This shows the configuration of equipment that was set up for the continuous growth of myeloma cells which was important in the generation of monoclonal antibodies. To the right is the spinner culture which was drip fed continuously from the container on the left. This enabled the cells to be kept at an optimal density. The cells could be removed as required. Overall the set-up was optimized so as to avoid contamination and to allow long-term cultures to accumulate mutants. The myeloma X63/Ag8 cell clone was isolated from a 3-month-old culture. In some cases some cultures were grown for up to 1 year. Photo credit: John Jarvis. Struck by the commercial possibilities for hybridoma technology, Vickers quickly looked to patent the technique and immediately alerted the National Research Development Corporation (NRDC), the body responsible for patenting MRC inventions, to see if they could file a patent. Action needed to be swift because British patent law does not allow for the disclosure of any work such as publication of an article prior to filing an application for a patent. While Vickers was quick off the mark in his attempt to get a patent for Köhler and Milstein's technique, intervening before the Nature article went into print, it was to take the NRDC several months and some prompting by the MRC before any action was taken. The response came in the form of a letter shown here, written in October 1976. By this time the opportunity for patenting the technique in Britain had been lost as by now the method had been published in Nature. The NRDC staff made it clear that while they recognised the possible medical and commercial value of hybridoma technology, they were unable to 'identify any immediate applications' so had taken no action to file for patent. Click here to see the correspondence between Milstein, Vickers and the NRDC. 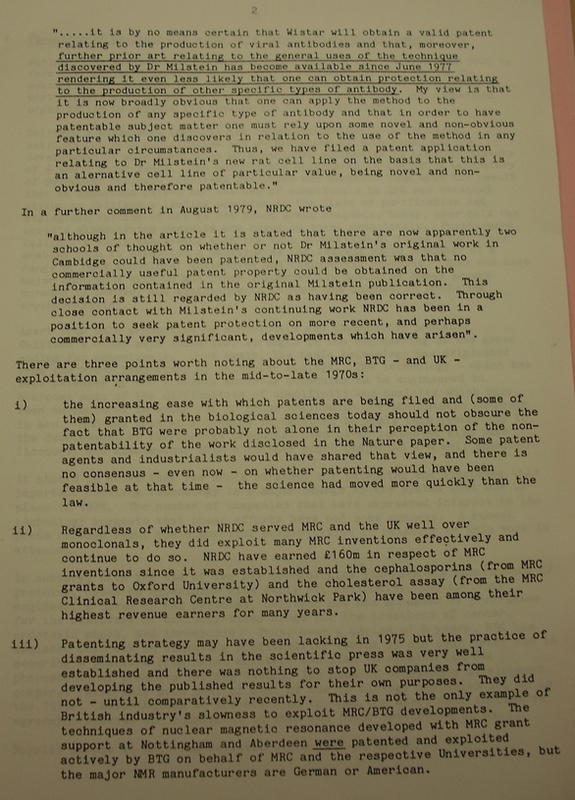 The failure of the NRDC to patent Köhler and Milstein's technique was to become the subject of much controversy in the late 1970s, a time of economic and political anxiety in the wake of the decline in Britain's manufacturing sector, and consequent rising unemployment. One of the most vehement critics of the failure to patent the technique for monoclonal antibodies was Margaret Thatcher, a chemist by training, who was elected Prime Minister in 1979. 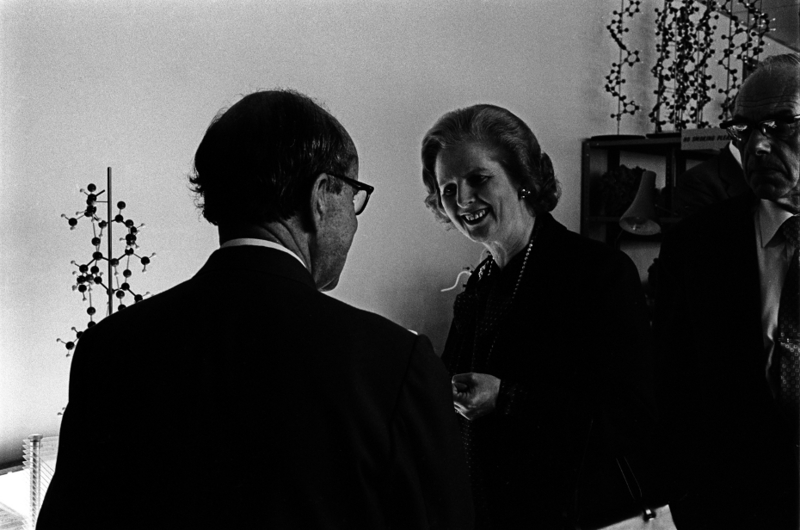 This photograph shows Margaret Thatcher, the British prime minister during a conversation with Max Perutz, a Nobel Prize winner and founder and Chairman of the LMB. The photograph was taken during a private visit to the LMB on August 27 1980. Thatcher's husband, Denis is standing in the background. Photo credit: MRC Laboratory of Molecular Biology. 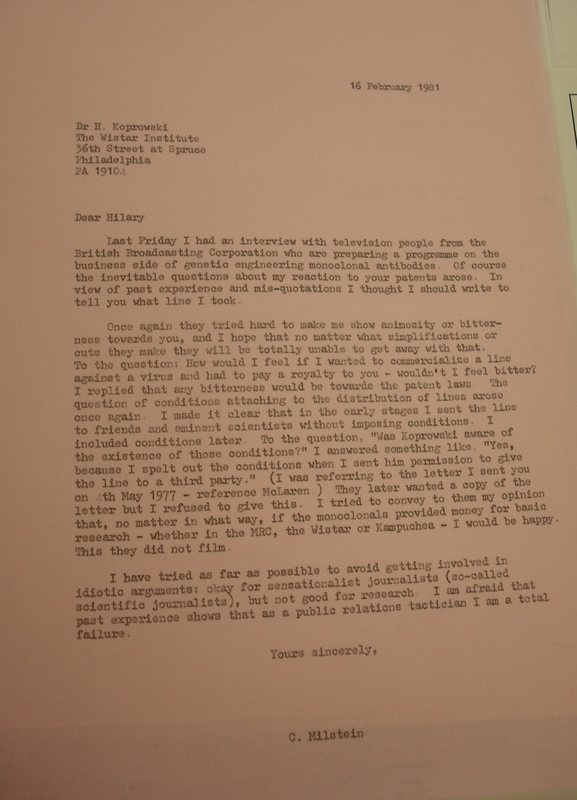 Click here to see Milstein's views about the patent affair that he expressed to Thatcher. 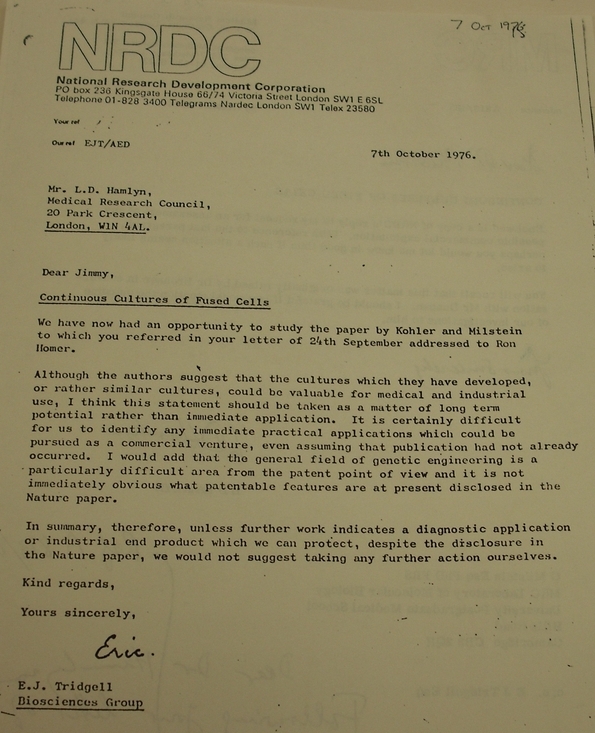 The anger over the non-patenting of Köhler and Milstein's technique was reinforced by the granting of two patents to Hilary Koprowski, Carlo Croce and Walter Gerhard for the making of monoclonal antibodies against tumours and influenza virus antigens in October 1979 and April 1980. These were the first ever patents awarded for the making of a monoclonal antibody. What was particularly galling about the Wistar patents for monoclonal antibodies was the fact that they had been created using the X63 myeloma cell line originally supplied by Milstein to Koprowski back in September 1976. Making broad claims, the Wistar patents provoked major controversy in Britain and in the international scientific community. 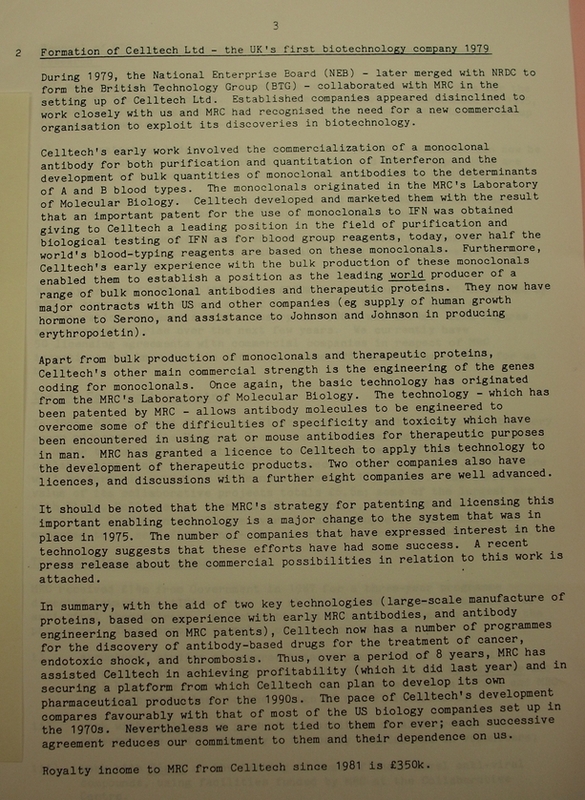 Many regarded the Wistar patents as patenting what many saw as effectively Milstein and Köhler's technique. Questions were accordingly asked about why Milstein and Kohler's technique had not been patented, leading to a major shake-up of British government policy on patenting and the commercialisation of biotechnology. Click here to see the first Wistar patent and Milstein record of sending of samples to Koprowski. 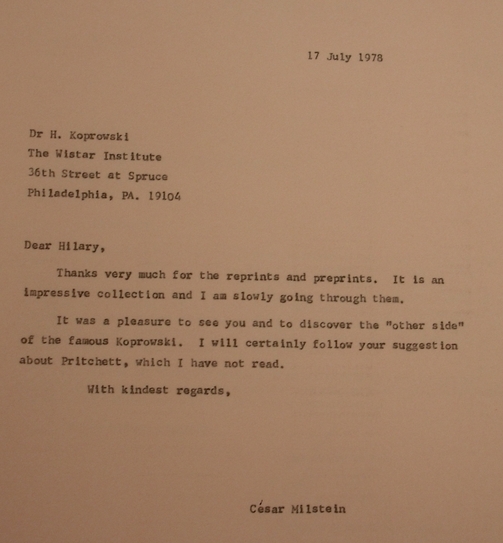 Milstein's supply of the cell line to Koprowski was in keeping with the tradition among many scientists at the time. The only conditions Milstein imposed on recipients was that they acknowledge in publications where they had sourced the cells and that they seek permission from him if passing them on to other scientists. He also made it clear that recipients should not patent any products from the cells. This stipulation, however, was difficult to enforce as demonstrated in the case of Koprowski. 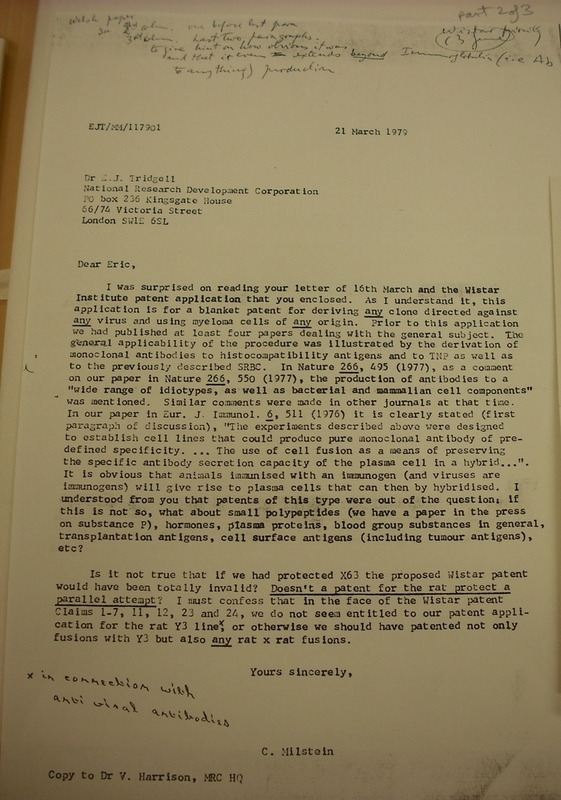 At the heart of the debate over the British failure to patent monoclonal antibodies was the extent to which Koprowski had ignored Milstein's request that no products be patented from samples sent by Milstein to other scientists. 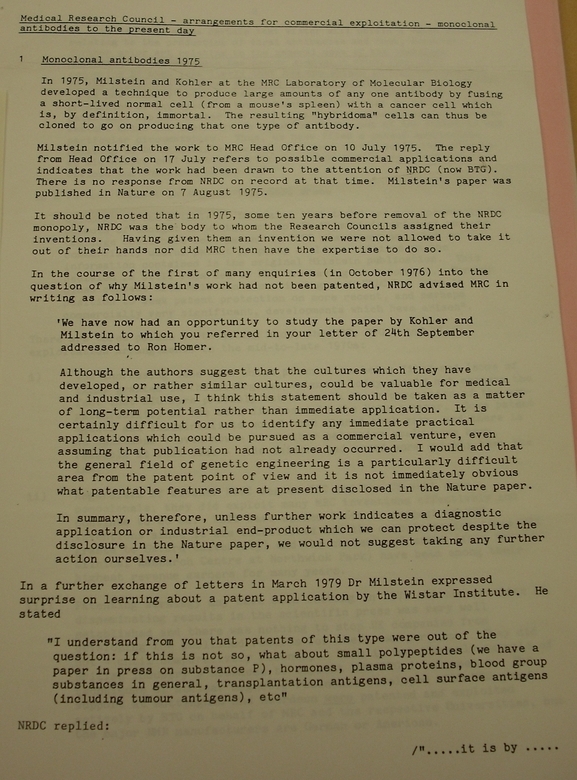 This shows the words Milstein pencilled on the letter written to him by Koprowski in November 1976. He wrote them some time later when trying to work out what had happened in the patent affair. 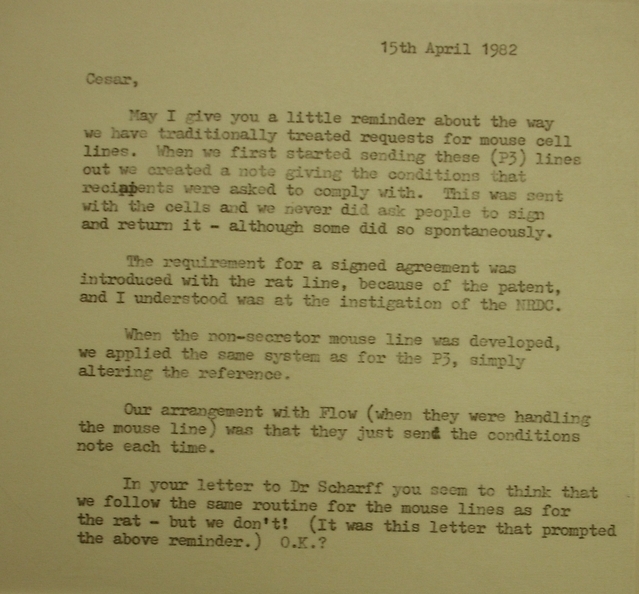 Source: Churchill Archives Centre, Churchill College, Milstein's Papers, file MSTN/C324. This shows Milstein with a flask containing monoclonal antibodies growing in a fluid. Photo credit: MRC, Laboratory of Molecular Biology. Wade went on to argue: 'The Wistar Institute seems in a sense to have jumped into the gap which Milstein and Köhler left. A broad patent for monoclonal antibodies raised against tumour cells was granted on 23 October 1979 to Hilary Koprowski and Carlo Croce. 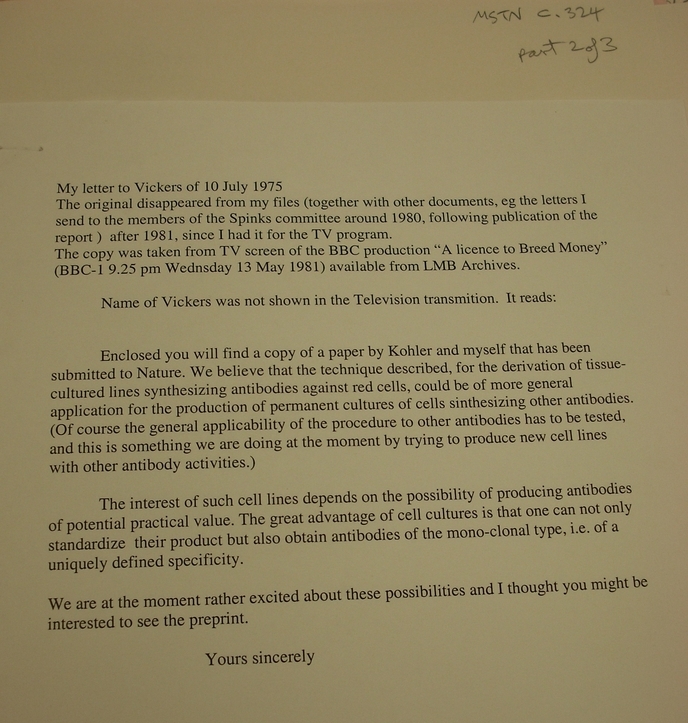 A similar broad patent covering the antibodies to viral antigens was issued on 1 April 1980 to Koprowski, Croce, and Walter Gerhard.' Wade also cited Milstein's unhappiness over the breadth of the Wistar patent application, for, as he put it, 'they are essentially patenting our procedure'. Overall, Wade's article raised concerns about the extent to which Koprowski had broken an agreement with Milstein not to patent any product based on the cell line he had supplied. Angered by the implication that they had stolen Milstein's procedure, Koprowski and Croce responded in a letter to Science denying they had contravened an agreement. 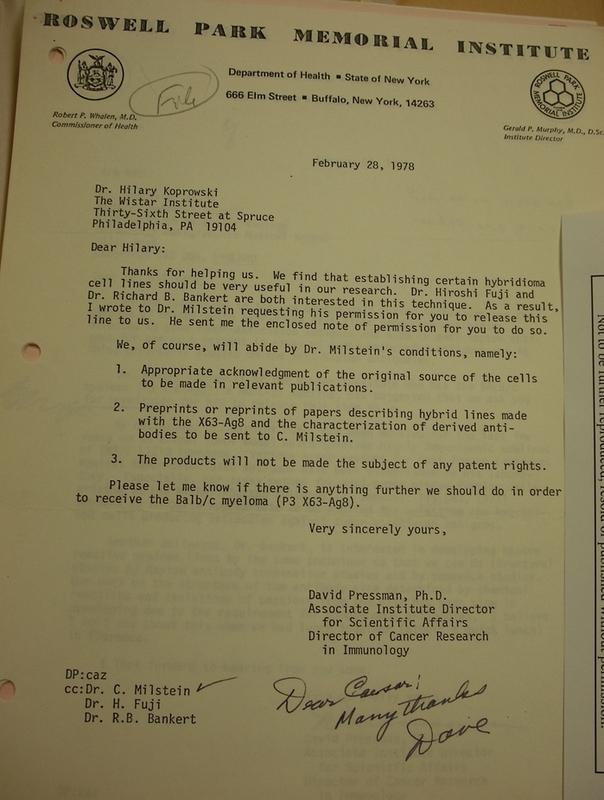 The difficulty Milstein had in countering Koprowski and Croce's argument was because he could not find any letters in his files to verify whether Koprowski had explicitly signed a letter consenting to the general conditions he placed on all recipients of his cells not to patent any products. 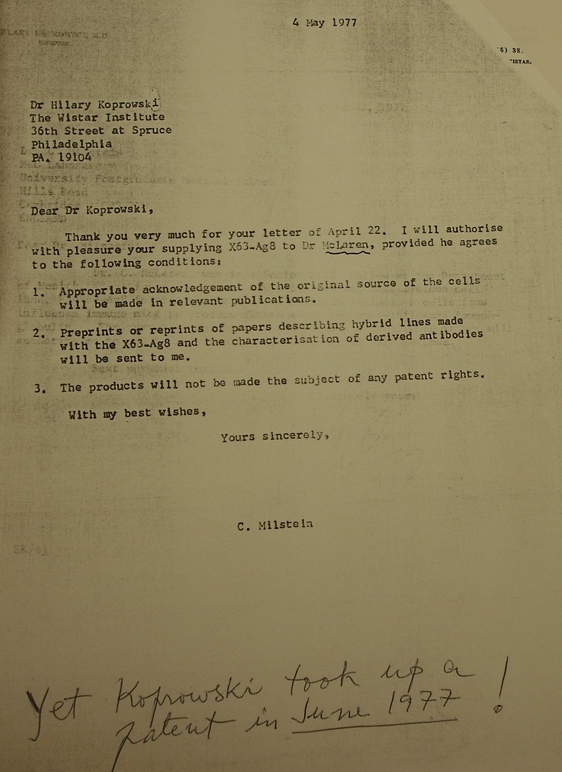 Click here to see various correspondence Milstein had with Koprowski and others concerning the patenting of the technique. In many ways the problems that occurred with Koprowski reflects the casual arrangements that were in place for sharing cell samples in these years. A more formal procedure was only put into place in 1978 at the request of the NRDC when they began seeking a patent for Milstein's development of a new line of monoclonal antibodies derived from rats. From this time on recipients were expected to sign a form waiving the right to patent before the cells were actually sent. As one MRC official admitted to Milstein, however, the difficulty was how far this could be enforced. Like many scientists at the time, Milstein viewed patents as slightly distasteful, a matter best kept separate from scientific discovery and invention and sorted out by lawyers. 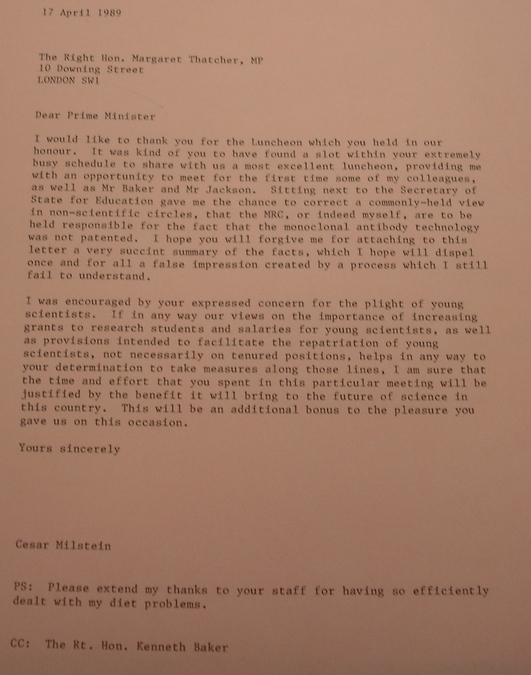 Moreover, Milstein believed he had done his duty by having sent a preprint of his Nature article when asked to do so by Vickers in July 1975. Some years later when asked whether he was unhappy not to have patented his and Köhler's technique Milstein was heard to reply, 'I was not unhappy, Margaret Thatcher was'. Looking back in his later life, Milstein would come to see the NRDC's failure to patent as in some ways a blessing. Crucially, it allowed him greater freedom to publish and get on with his research. Had the NRDC moved forward on a patent, he might have been forced to become more secretive about his work. Moreover, in not patenting the cells he and Köhler had created, many scientists were able to move much faster in working out their application. 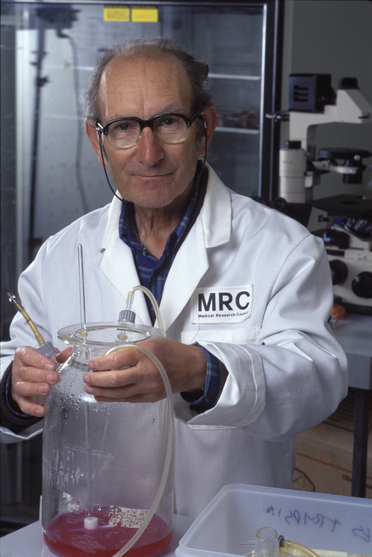 In many ways Milstein's attitude was reflective of the more general dislike of commercialisation within the Laboratory of Molecular Biology in the 1970s. The situation was reinforced by the fact that scientists working within British government-funded biomedical laboratories were not entitled to any royalties accruing from patenting their innovations at the time. This sentiment only really began to change in the 1980s when the MRC established a new scheme allowing for the sharing of royalties with inventors. Click here to see some of Milstein's sentiments on patents. While stimulating intense political debate in the late 1970s and early 1980s, some doubt the degree to which the missed patent for Köhler and Milstein's technique contributed to any real loss in the long-term. They argue that there would have been only minimal financial gain from a patent for the type of monoclonal antibody that the two scientists created because it had limited applications and required considerable refinement before it could be clinically applied.